Cruelty Free International is today urging governments worldwide to end the use of stray and shelter dogs in experiments. 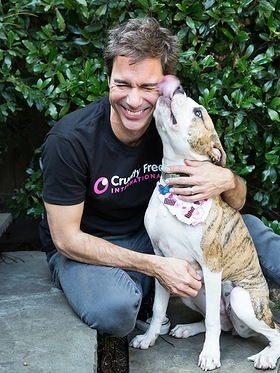 The campaign has received celebrity support from Canadian actor Eric McCormack (Will & Grace), US actors Seth Gilliam (The Wire, The Walking Dead), Lou Diamond Phillips (La Bamba) and Danny Trejo (Breaking Bad, Sons of Anarchy), US TV personality Cat Greenleaf, UK musician Kate Nash and Cruelty Free International Global Ambassador, international superstar violinist Vanessa-Mae. A new investigation carried out by Cruelty Free International has revealed that stray dogs from government funded shelters in Brazil are given to universities for use in experiments or practical teaching classes at veterinary schools. Other countries in which stray and shelter dogs can still be used in laboratories and educational institutions include the USA, Canada and Australia. According to a new opinion poll carried out by YouGov on behalf of Cruelty Free International, the issue raises strong public concern. In the UK, 72% of adults oppose the use of dogs in experiments, while 73% of Canadian adults and 68% of Americans agree that dogs who are found or given to animal shelters should not be sold to laboratories for experiments.